That's an awesome addition. Color me green with envy. I can hear Bill Murry now- DIE GOPHER! that is Super Fine ! Very cool. Looks like fun. Reminds me of back when we sometimes bought 22 shorts or longs because they were cheaper than long rifles. My Model 61 handles them all. And just saw one for sale - NIB for $3900.00. Wow. Super nice. Congratulations on a good one. Oh, you're gonna enjoy that. Are you going to put a tang sight on it? Shrapnel, that is a rare bird indeed. Was WF Sheard a gunsmith? Hardware store owner? Any idea how long he was in business in Livingston? I wish I had your gun show to attend. The one I went to here in Alamogordo on Saturday was infested with knitted pink beanies, scented candles and even kids' coloring books. The horror! Sheard was a gunsmith, gun shop owner, and sight maker. You may have heard of Sheard marked sights? That's a great collection of Sheard marked guns. We never see them around my area, and I love old guns with maker's or seller's rollstamps. As long as they were professionally done by well known shops. Question: Since the cases are the same for both the "L" and "LR", can you shoot long rifles in that rifle? Very nice find. Like a bigger better made Stevens 44... my M44 drives tacks at 115 feet with a $7 Walmart Tasco on it.We supposedly have the correct scope around here somewhere. Could be a tough one to scope and miss the various Sheard and caliber rollstamps. Need one back by the action, and another 7.2" forward. Quite likely one of the two would damage the stamps. That was a good find for a regular gunshow...half rd/oct are hard to find in any model. You can scope them with destroying anything. This special order Low Wall in 22 Long Rifle with an 28" barrel and set trigger has a contemporary 36" Stevens scope that uses the dovetails...(it does not letter with the scope but it's 99% the original owner put it on) .....pretty much the same as the modern MVA period scopes do which I have on a High Wall 40-82. Some .22 long rifles will chamber .22lr but I believe the rate of twist is different between the two so accuracy may suffer. Wow, that is a nice gun. The only redeeming thing about mine is that the bore is bright and it is Sheard marked. Would you be willing to loan me that scope for awhile??? Sure Shrapnel.....hey....your in the vicinity of MVA. Those guys make one hell of a scope...the blocks that fit into the dovetails are color casehardened...but you probably know that. ....those guys are probably buddies of yours as Montanans stick together, unlike us eastern guys. Never had a '74 sidehammer....never could find one like yours that fit my criteria....decent, solid, good to excellent bore, original...finish is not important as there's probably not 500 '74's with 50% or more condition left........ones I found were either worn and loose junk with sewer pipes or $10,000 examples....similar to my experiences with a '76 Winchester. Did own a '78 military Borchardt that was loaded with condition....that baby shot super....lost interest in it and moved it as there's nothing like a heavy barreled single shot which is what I wanted. 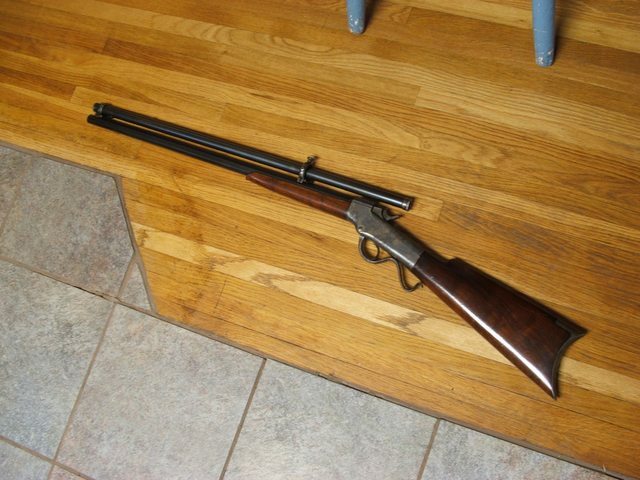 Not Winchester 1885, but I have a full length Stevens scope on my Ballard #3 also. Originally a .22 Long, but was sent to Stevens and is marked as "Rebored by J Stevens A&T .25 Rimfire"
those are really nice !!! you have an amazing collection... makes mine look like a pauper ! What a collection, thanks for sharing. Aye it tis! Very nice addition Shrapnel. Me three. What a find!!! Some day I'm going to finally get hold of one of those Sheard triple-leaf sights. There was a guy in NY making a run at reproducing them but I don't think he ever did more than a couple. Shrapnel, that is a great gopher rig now ! I love shooting those lttle pests when I am in Bozeman ! Rimfire, l I have a lot of unusual sights, but on ly one of those and It needs a little repair. very hard sight to find. That Marbles front and rear sight looks like it was put there when the rifle was made! I too, like the Sheard front sight having them on at least a dozen of my shooters. I like the fine bead ones like yours....well, I really can't remember seeing any of big beaded Sheards. One of the best, if not the best front hunting front sights. For target, it's hard to beat the standard straight front blade like you see on military guns. I don't find Sheard front sights hard to find..if you know where to look. I have a couple of dozen of them around here, most all Marbles marked from back in the day. In fact, the other day I put a real nice clean example on my smallbore silhouette rifle, a model 63 Winchester. Marbles made them for decades. The ones that are rare are the original Sheard marked sights. I also found a die made by Neal Waltz that can put a hollow point in the 22 long bullet. It is hard enough to find 22 lons, but you can't find any that have hollow points. This tool is finely machined and it is made to put an adjustable depth to the hollow point and it also has a top punch that you can just flatten the end of the bullet. The process of putting the hollow point, also swages the bullet into the die and makes the bullets a perfect .225 caliber, which is supposed to help accuracy too. Ain't that somethin! 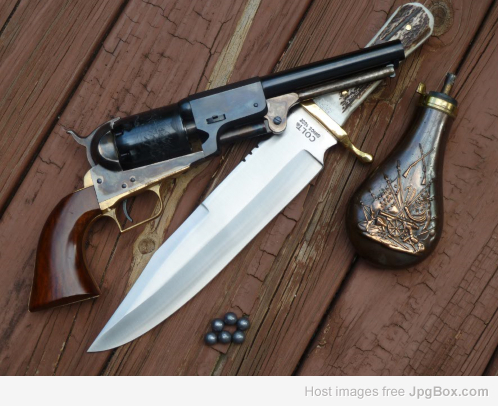 Does the die also work with long rifles? That 73 of yours looks to have plenty of condition......will it take high velocity ammo? ....yea, weird question ...big rifle with a puny cartridge but as you know the early pre HS Marlins 39's would crack the bolt with high vel ammo. Could have had several Colt Lightnings over the years in 22 Long but did not know whether they could take the higher speed ammo so I let them pass. What a Great Rifle and all of the other treasures . Thank You for the post. Keep Up the Good Shootin... .